This chapter reviews some of the major business applications of social media and discusses how social media applications are used to support business model improvement. Social media offers business organizations an array of innovative ways to interact with their employees, customers, partners, and other stakeholders. Consumers have easy ways of interacting with companies and their employees in real time with various social media embedded devices. Managers are realizing that social media affects a wide spectrum of business activities from building product or brand awareness to after-sales services. Therefore, it is crucial for companies to analyze their social media applications, develop a plan to continually monitor their advancements, and quickly respond to the social media needs of customers. 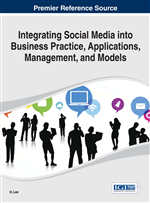 For practitioners, this chapter provides managerial guidelines for social media applications for business model improvement. Recently, the Web paradigm shifted from a business-centered focus to user-centered one. This paradigm shift has become known as “Web 2.0”, coined by Tim O’Reilly in 2004 (O’Reilly, 2007). Web 2.0 refers to a website that has evolved beyond Web 1.0 and features user-created-content and online communities that allow website visitors to interact dynamically with the site. While technological distinctions between Web1.0 and Web 2.0 are often not clear in some areas, the social and technological environment for positive user participation and interactivity epitomizes Web 2.0. Social media embodies the principles of Web 2.0 and is continuously evolving and offers business model improvement tools and support business processes, knowledge management, customer relationship management, and partner relationship management. Despite the lack of a comprehensive framework for the use of social media applications for business improvement, businesses are eager to use them. Managers are already active users of the various social media technologies such as social networks and blogs. Managers are realizing that social media affects a wide spectrum of business activities from building product or brand awareness to after-sales services. For example, investing in social media applications will enhance relationships with customers and provide the opportunity to better understand the customer needs. Therefore, it is crucial for companies to analyze their social media applications, develop a plan to continually monitor their advancements, and quickly respond to the social media needs of customers. The main purposes of this chapter are to explore emerging social media applications and to discuss social media applications for business model improvement. This study proceeds as follows: Section 2 presents a literature review on social media and business models. Section 3 explores social media applications for business model improvement. Section 4 discusses managerial guidelines for social media applications for business model improvement.